Revised and updated November 2014- direct line in bold. Birth years with no day or month given are approximate; BVRI = 2nd edition of British Vital Records Index (LDS). Elizabeth was baptised on 10 Aug 1757 in Princes Risborough, BKM. Robert (sen'r) died in 1824 aged 71 and Elizabeth in 1815 aged 58. The parish registers of Chinnor give the following, who are all children of this marriage, the father being named as Robert, . No mother's name is given for the first three but the relationship of William, Robert and Isaac is shown by William's will, proved on 24 Jun 1856 in Oxford. 2. Ann Stockwell ('Stockall') chr. 23 Jun 1782; bur.16 Aug 1801 in Chinnor. 5. Isaac Stockwell b. 1 Aug chr. 7 Aug 1803 (son of 'Robert and Elizabeth of Henton') m. Elizabeth Umfrey. Martha b. 1826 and William b. 1821 were living with them and at first glance could be assumed to be their children, but William is listed as 'M.S.' - a manservant. - in fact a niece and nephew, children of his brother Robert (1790-1872). The last will and testament of William Stockwell, who died on 3 Feb 1856, son of Robert and Elizabeth [Bowler] and brother of Robert junior (next) was found by Paul Brazell in 2004) Legatees were brothers Robert and Isaac, and Robert's children, 1. Joseph, 2. James 3. Mary [Howlett], 7. Elizabeth [Britnell] and 8. Martha ['Brassell'], William's nephew and nieces. It's not known why William, no. 6 received nothing but it's possible he benefited in his uncle's lifetime. (Which is what happened also in a similar instance elsewhere in one of our families where someone appeared to have been passed over). i. Emma Umfrey Stockwell b. 8 Jun 1834 in Chinnor, chr. 1 Aug 1834 at Chinnor Independent. v. William Stockwell b. 7 Jul 1841 in Chinnor, m. (1) Susanna Brighty b. Dec Q 1839, Huntingdon on 5 Oct 1869; she d. 3 Mar 1879 Astwood, Bkm. iv. Herbert Humphrey Stockwell, farmer of 256 acres at Astwood, Bkm m. Agnes Brighty (b. 1843 St Neots, Hunts) at Risbridge, Sfk in the Dec Q 1871. They had 3 children, all born in Newport Pagnell, Bkm., Elizabeth Mary Sep Q 1874, Anne Priscilla Jun Q 1876 and Thomas Umfrey 20 Mar 1877. (Thomas d. in Fiji, 1851). As none of the family (apart from Thomas) have been found after 1881 it is assumed they emigrated to New Zealand with William. v. William Stockwell and Susanna (Brighty) had four sons, William b. 29 Jan 1871, George, b. 3 May 1872, Edward b. 1876, Thomas Umfrey b.22 Oct 1877, and a daughter, Anne Elizabeth who is said to have died at Astwood - see Herbert , no.3 & below. Eliza Brighty, William's 2nd wife, was Susanna's first cousin. She had two sons, Robert Brighty Stockwell and Harry Brighty Stockwell. They all emigrated to New Zealand in 1887-8 on three different vessels. With many thanks to Ian, a descendant of this family. Mary Ann was previously given as 'Marion', which of course produced no matches, but should perhaps be listed as an alternative as the two sound so similar. Free BMD gave her full name - when the 'spouse name' was omitted from the search! Thomas was easily identified with his unusual 2nd name of Umfrey. vii. The birth of George Stockwell who carried on the business after his father's death gives an approximate date for the family moving to Aylesbury. The shop in the Market Square was very much in the best position in the town. No children are listed for George but he was only 25 in 1881, his mother, now 67 and his sister 'Emma U.' (46) living with him, plus two drapers' assistants, an apprentice and two servants.. As far as is known he never married and had no children. Joseph Stockwell b. 23 Jun 1810, chr. 12 Aug 1810, m. Elizabeth Tipping, b. 1817 in Saunderton, BKM. James Stockwell b. 21 May 1812 chr. 14 Jun 1812 m. (1). Sarah Britnell (1809-?) on 14 Nov 1835 in Bledlow, (2) Martha Oldham (1823-1865) at Wallingford Baptist Chapel on 31 May 1848, (3) Elizabeth Sharp on 14 Feb 1866 at Holy Trinity Church, Walton, Aylesbury, James died 1872. Ann [Sanders] may have died in childbirth with Robert but so far the evidence is inconclusive. 1. Joseph Stockwell, son of Robert jun'r. In 1841 Joseph Stockwell was working at Great Latchford as an agricultural labourer. By 1851 he had married Elizabeth Tipping b. Saunderton (in the Jun Q 1847) and become a baker and grocer in Stokenchurch. For a while they moved to Downham Market, Norfolk, Joseph by this time a 'druggist and herbalist' then by the next census in 1871 had moved on to Great Dunmow in Essex. By 1881 Joseph had returned to Buckinghamshire and opened his herbalist's shop on Bell St, Princes Risborough where he remained till his death in the Jun Q1896. [Thame Reg.Dist Vol.3a p.388] Joseph and Elizabeth had no children of their own. There could be a clue to family relationships - as given to the Head of the household - in the 'niece', Elizabeth Loosely staying with Joseph and Elizabeth in 1851, probably a daughter of an Elizabeth Loosely, a lacemaker born about 1801 or a daughter of William Loosely, a farmer. The child is recorded on the 1841 census with her mother as Elizabeth, but no father in evidence, so William can be ruled out as his wife was named Ann. It's also worth noting that Elizabeth junr was a lacemaker in 1851 and children learnt this craft at their mother's knee; in another Loosley family in the same area a child of 4 is listed as a lacemaker! (Working long hours by candlelight often ruineerd their eyesight) Children's ages were not usually rounded down but must have been in this case as the IGI has a record of an Elizabeth as the daughter of Charles and Elizabeth Loosley, born in Lacey Green, Princes Risborough (Batch #C029212) in 1832. Between the censuses two Elizabeth Loosleys died in that area, in 1841 and 1845. One may have been William's daughter, the other may have been Elizabeth senr who might be assumed to be formerly Stockwell - except that Joseph had a well-attested sister Elizabeth born in 1820. (This does not guarantee that the right Elizabeth has been found of course.) After 1851 neither mother nor daughter can be found but in 1891 a Mary Loosley, also a niece, aged 42, turns up living with Joseph and his wife! No connection has yet been found between the two 'nieces' among the possible families involved so far, so the mystery of who they were remains unsolved. 3. Mary Stockwell is mentioned in her uncle's will. She was born in Henton, Oxon on 6 Jun 1814 and christened on 3 Jul 1814 in Chinnor. The witnesses at her wedding on 6 Jun 1833 to John Howlett, a widower, were Joseph Stockwell (brother), Mary Horseman and William Fryday. Note: A number of very interesting discussions have been held on the Oxfordshire mailing list run by Rootsweb. These can be accessed via their archives. Search for any of the surnames involved and look in particular at 2002. It is worth explaining here why 'chr.' has been used throughout these records rather than 'bapt.' This is only for convenience to distinguish it easily from 'b.' for 'born' and doesn't refer to baptismal practices. The Stockwells and Oldhams were probably mostly Baptists, certainly by the time of the last few births. 'Christening' in contrast to 'baptism' is frequently used as meaning the same as 'baptism' but whereas baptism obviously refers to the pouring of the water - the essential part of the ceremony - christening can imply the rest of the ceremonies, such as an anointing with the oil of chrism or the touching of the person's mouth with salt, plus a number of additional prayers welcoming them into the church or chapel. The only essential part of the initiation into the Christian faith is the baptism with water, signifying rebirth. William Carey, the famous Baptist minister, was himself baptised in the Anglican church as a child and then received a 'believer's' baptism of full immersion in the R.Nene in 1783. Some Baptists consider only total immersion to make sense, like Carey pouring scorn on the sprinkling of infants which he called 'rhantism'. The symbolism is certainly more vivid. Ann was a lacemaker before her marriage at the age of 34, like most girls in the Britnell family and must have been taught as was usual by her mother from an early age. It was said that if a child didn't learn early enough they could never master the intricate neat stitching properly. It was a common cottage industry in the area at that time, often with several in a family taking part, and probably very hard work, both on the eyes and on the fingers! Sarah died on 23 Sep 1847, of 'inflammation', a vague enough term to cover a multitude of complaints, not childbirth at that distance of time as previously assumed. Annie married on 11 Aug 1870 William Henry Eborne, a gardener, b.1844 in Aylesbury, and they had at least one daughter, Rosa S. Eborne, who is listed on the 1881 census, aged 9, when they were living at 10 Ripon St, Aylesbury. William was later one of the witnesses at James Stockwell's 3rd marriage. Many thanks to Mary Anne Britnell who sent full details of several generations descended from Thomas Britnell of Bledlow chr. 9 Feb 1779 at Holy Trinity, to cousin Robert Stockwell who added the Eborne information, and also to others on the BKM Rootsweb mailing list where relevant 'threads' can be found. Other Eborn(e)s can also be found connected with the Hester family under 'Cousins' below. James Stockwell later married Martha Oldham in the Baptist Chapel at Wallingford, BRK on 31 May 1848 (copies of both birth and marriage certificates), the marriage witnesses being Jane Oldham and John Oldham. Martha's sister and brother. They all signed. Some records quoted by the IGI were only available from Dr William's Library in London. This library specialises in non-conformist church records though it is possible they have now been deposited at the PRO at Kew..
James and Martha lived mostly in Chinnor St, Chinnor where all the children except the last were born. (Some excellent photos of this village are available through a link on the Bucks pages of GENUKI) They had eight children plus Annie who was still living at home in 1861, then aged 25, but George, the last, was almost certainly born in Aylesbury. It would have been between the census of 1861 and the birth of George in 1865 that James and Martha moved into Aylesbury. George was born on 17 Feb 1865 and Martha [Oldham] Stockwell died on 27 February 1865. She died not as a direct result of the birth but from bronchitis, at Kingsbury in Aylesbury. George, only ten days old, did not thrive and he died (of 'debility') only ten days after his mother on 9 Mar 1865. A photo in the Phillimore Pictorial History of Aylesbury shows the baker's shop, a tiny two-storey building one room wide with lattice shop window, dwarfed by the 3 storey building of Makrill & Sons Engineers and a frontage of six larger windows next door. This square has already been mentioned as the place where Thomas Umphrey Stockwell had his draper's shop, at nos. 9 & 11 in 1881. However, Thomas was born in 1849 so only about 16 in 1856. If his family had moved to Aylesbury by then he would have been still at home working as an assistant to his father in the Market Place. 'born at sea' about 1869 was living with Samuel and Martha in 1881. 1. Mary Jane Stockwell, known as 'Polly', was just over 18 when she married James Barnes, then 21, on 14th August 1867 at Holy Trinity Church, Aylesbury. James was baptised on 5 Apr 1846 in St Mary's, Aylesbury, the fifth of 8 children of George Barnes and Mary Hedges. The Stockwells had been living in Aylesbury (see above) from before 1865. The Baptist chapel on Walton St, no. 44, must have been more or less opposite the 'Horse and Jockey' run by George Barnes, father-in-law of James at no.45. (Very few of the old buildings on Walton St remain) It definitely seems, however, that Mary Jane 'conformed', especially as the Barnes children were all baptised in the Anglican church, one, Thomas James Barnes later at times organist or sidesman in his local church. Thomas was, as one of his children said, 'low-church' Anglican. >2. John Stockwell was the grocer on 38 Castle St, Reading (St Mary's parish) who is described in the 1881 census as 'born in Chumnor'.He also, not surprisingly, appears in the local directories. He married Ann Coker on 26 Dec 1872 at the register office in Reading. Annie was the daughter of a butcher who probably had his shop on the same street, Castle St, in Reading though he had died by 1872. John married again as a widower, aged 44, to Amelia Charlotte Ellis on 2 Jun 1895 at Carey Baptist Chapel in Reading. She was aged 33, the daughter of a 'builder' (who was listed as a 'stone mason' in 1881 and had came from Sussex via Surrey and Hampshire before perhaps arriving in Reading.) Amelia herself had been a governess to several young children of a farmer in Bedfordshire in 1881. Whether Amelia had any children is not known, but John Stockwell died on 13 May 1911, at 29 Castle St, Reading. By 1880 and the birth of their 2nd child, Frederick Reginald, on 21 Dec. Robert and Mary Ann were living at 17 Willington Road, (wrongly printed on the LDS CDs of the 1881 census as 'Wellington'. Robert was also confusingly printed as born in 'Bliddow' Oxfordshire. 'Bledlow' was in Bucks but Chinnor in Oxfordshire) They had 9 children in all. By 1903 on the marriage of his son Frederick, Robert is given as a Master Printer. 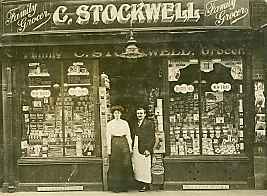 On 2 Oct 1914 now a widower of 57 and resident at Clapham Common, Robert Stockwell married a 2nd time, his wife Sarah Lawrence [formely Boulden], aged 55 and resident in Camberwell, being a widow. The ceremony took place at Surrey Tabernacle. Robert died in 1922, by which time they were at Streatham Hill but he actually died in the street, in Catford. With many thanks to cousin Robert, descendant of this family, who supplied many details backed up by a large number of BMD certificates. Other Baptist records concerning the 'earlier' family of Oldhams were found on an entry from Dr Williams Library in London, a collection of nonconformist records, and only came to light through the LDS Vital Records Index. The records of the established church are easier to find! Joseph Brazell (senior, father-in-law of Martha, last child of Robert Stockwell and Ann Sanders) also had a son William Brazell who became a baker. William began his own bakery in Waddesdon where he married Mary Ann Windmill on 7 May 1860. Their first two children, Louisa J.Brazell and Kate Brazell were born in Waddesdon but then the family moved to Aylesbury where the rest of the children were born. William died about 1879, leaving his wife, Mary Ann with 8 children. Mary Ann is then recorded as the baker in the shop on Kingsbury Sq. in 1881. The children were Louisa J., 19, baker's assistant, Kate, 18, a printer, Joseph, 15, baker's assistant, Ellen 13, Francis A. (sic, a daughter), 10, Fredrick (sic) 8, Beatrice H.,4 and Percival W., 2. [Census of England & Wales, 1881, April 3/4, RG11/1472/74 p.8, RG.11 Series] In 1891 Joseph, Frances, Frederick, now a printer compositor.and Percival were still living in Kingsbury Sq with their mother. Elizabeth, daughter of Robert Stockwell & Ann Sanders, married Jonah Britnell on 2 Feb 1843 in the Independent Chapel in Chinnor. Three children are recorded, Eliza Britnell, (1845), Emily (1847) and Robert Thomas (1850). Jonah died on 22 Jun 1851. Elizabeth's uncle, William Stockwell died on 3 Feb 1856 and Elizabeth is mentioned as a beneficiary in his will. In the Jun Q 1856 Elizabeth married John Hester of Henton Chinnor, a widower, who had 5 children by his first wife, Ellen Jerred.. Elizabeth's and John's children became linked a few years later by the marriage of Eliza and William. All but a few of the 35 (known) grandchildren below were still living in 1911. One particular difficulty with these three families (including that of Jonah Britnell and Ellen Jarred) is the frequent use of the same first names, and another is the boundary between Oxfordshire and Buckinghamshire which changed over time and can be misleading. The Hester children were born in Hempton (Wynnal) and the Britnells mostly in Chinnor. James Britnell - aged 3 mths on the 1861 census named as 'illegitimate' & 'stepson', in John Hester's household ; b. Saunderton, near Princes Risborough. ; parentage unknown; (probably a son of Eliza Britnell,- according to the 1861 census she was 16, but then why born in Saunderton - except as suggested by Linda, a correspondent - for which many thanks - that Saunderton was where the Wycombe Union Workhouse was situated. He can't be Elizabeth (Stockwell)'s son as both children she had with John Hester are of course surnamed Hester and she seems to have died about 9 months before James was born. Even if Elizabeth's date of death is wrong and he was her son, he would surely still have been called 'Hester'? So Saunderton is now assumed to be correct as is also the surname Britnell. *A search of all birth records finds no James 'Hester' born in Oxfordshire in 1860 or 1861, nor does not appear in the census for 1861. *No James 'Britnell' is listed in 1871, but by then Eliza was married to William Britnell so it's not surprising to find James, as the census has it, born 'Saunderton, Bucks' now named as 'Hester'. There was no system of legalised adoption (which only came in about 1926) so it does not imply a relationship to William who like Eliza, was about 16 at the time. *James was also 4 years older than the next oldest, Emily. From then on Eliza had a child every one or two years until 1889, 16 more after James and all born in Hempton or Henton, Chinnor. James is found as a next-door neighbour to George Hester of 1855 in the 1881 census, married (in 1876) to Rose Eborn (b. 1859 in Grt Haseley), daughter of Joseph, but the 1891 census is so smudged it has been entered as James b. 1850 and Rose named as Ann. (It looks much more like Rose, and one of her daughters is Rose Mary) 1901 has James born in Slough but he has filled in the 1911 census himself as aged 50 - i.e. born in 1861 and his birth as in 'Hempton Chinnor' (and not Saunderton!) Rose is not listed but James simply enters 'married' but doesn't say how many children they had. He and his two daughters,Emily and Louisa, were living in 3 rooms..
James Stockwell's daughter Ann (her mother being Sarah Britnell) married William Henry Eborn. (see above) No connection has yet been found between these Eborns but curiously - beside the Britnell connection - William died in Headington (1924) and James living in Wheatley in 1911 was in the Headington Registration District. William and Sarah also called their daughter b. 1872 Rosa, but this could all be just coincidence. Some details of the above cannot be reliably confirmed without birth and death certificates. Births with no Q are taken from censuses and have not been found in any BMDs but registration was not yet compulsory. Alternatively they may turn up in nonconformist records. One oddity is that James Hester is listed in the 1881 census as Eliza's brother (brother-in-law of the head of the household, David Ginger) with a birth date of 1847 rather than about 1843 (as listed in 1851 and 1871) It seems likely that he was confused here with George who had presumably died in 1852. Census details for the above three families and the two families in the younger generation are available if required. William is described, like his father Robert, as a labourer of Henton, in the parish register of Chinnor. He and Mary had 6 children, 5 being baptised on the same day, 25 Apr 1872. Why such a 'batch' baptism, which included the mother, Mary, nee Plastow, is unknown but the other similar one in these records was also in 1872 (see the Ricketts family in Guildford). It could be just a coincidence, a zealous clergyman or perhaps an alarming outbreak of disease? In the case of Annie, baptised soon after birth, she probably was in imminent danger of death. William Stockwell and Mary Plastow are the ancestors of Jeanne Helm and Harry Newman, to whom many thanks are due for information and discussion. Joseph died on 5 May 1867 in Chinnor. On the 1881 census only Martha is listed as still at home, 23, unmarried and a dressmaker, living with her widowed mother. She married two years later. Martha [nee Stockwell] Brazell, died on 19 Oct 1899 aged 77.. Unfortunately the relevant Brazell website on this family appears to be no longer available. Any information ould be welcome!